Our All Terrain Vehicle and UTV training courses are designed for professional operators of Sit-In ATVs and are accredited by Lantra-Awards. We can provide this training across Devon and the whole of the South West (and in fact the UK, please contact us for costs). We can also travel to your site, assess and train your operators in their working environment on the machines they will be using on a daily basis. Designed to assist with PUWER compliance, this training covers the recommendations of the HSE and is recognised by government, industry, military and most major landowners. We can train two novice operators in a day, or up to three experienced operators. Costs vary from £300-£400/day, and the certification is £35/candidate. 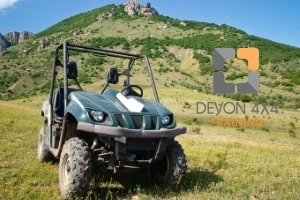 This course is designed for operators of John Deere Gator, Polaris Ranger, Kubota RTV, JCB Workmax and other, similar side-by-side off-road vehicles.